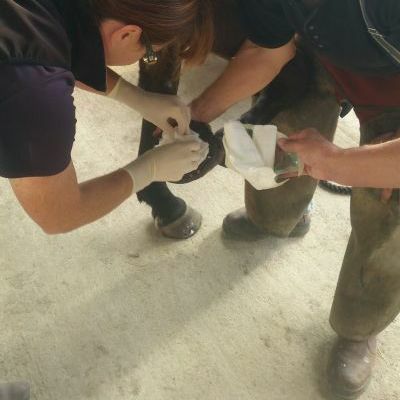 Vet Services Wairarapa carry out a large number of lameness or poor performance examination workups, whether they be directly from clients or a s referral from other vets or physios / farriers. We are very happy to work with other professionals to optimise the result for your steed! We have a equine facility available at our Lincoln Road practice In Masterton, with a trot up plus a dedicated equine unit where we can do our nerve and joint blocks, xrays and ultrasound. There is a very safe stocks available to enable thorough examination as needed, plus faciltate further diagnostics and treatments such as sacroiliac joint injections and accupuncture. The mobile nature of the business can mean that a second opinion including nerve blocks and digital radiography or ultrasound scans can be also be done on the horse's own yard. This is obviously convenient for the horse owner but can also mean some subtle problems are highlighted - sometimes adrenaline levels can be raised in a different environment, masking subtle lameness or performance issues. We also have the convenience of Panorama Equestrian in Gladstone, where there are a full range of facilites, including trot up area and a 60 x 40m all weather arena to investigate cardiac / respiratory conditions or lameness only seen under saddle, and a purpose built levelled concrete area to do all xrays but especially foot balance ones to help your farrier. In an ideal scenario, we would like a talk ahead of the visit to go through the problem in mind. This is to help to try and predict what sort of exercise/ facilities and time will be needed ( eg if a problem is only seen in canter when under saddle, this needs to be able to be demonstrated). To enable our pricing to be as competitive as possible and to prevent unnecessary visit and examination charges to the client, we have put together some guidelines to optimise the benefit from each visit. We can provide most of the following for you at our practice or at Panorama. Please note that these are guidelines only and we will do the best we can in each scenario. If you are unsure at all, just ask! A flat, straight and hard area for trotting the horse up. A quiet road is fine; arena surface is too soft. It is preferable that the horse has been shod or trimmed regularly but not immediately prior to the examination. If it is found that the horse loses, or is about to lose a shoe/s then it may well be that the examination will need to be rescheduled for after this is done. A clean horse - it is much easier (and safer) to be performing nerve blocks or to examine tendons/ joints with a clean horse. It is also preferable to not have any hoof dressings on. It is surprising how long it can take to get to the bottom of problems, especially if subtle, long standing or multi limb but we are always happy to keep perservering! We are happy to discuss costs before and during workups or treatment and tailor the plan accordingly - the health of your horse is a team effort so never be afraid to ask questions. Vet Services Wairarapa Equine Information Evening: An informative and entertaining evening discussing topics relevant to this time of the year. Equine Remedial Farriery & Rehabilitation: Join the Equine Information evening on Thursday 16th August 2018 from 6pm.